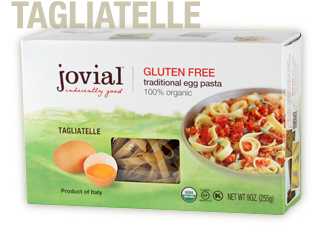 Jovial was kind enough to send me a box of their Gluten Free Brown Rice Egg Tagliatelle and a jar of their Diced Tomatoes. The timing was perfect as I had been craving pasta for a while. Being gluten-free for as long as I have been, I can assure you that is indeed the best gluten-free pasta that I have had. But, I would feed it to any gluten-eater out there. Any day.